Patients with cirrhosis and ascites often develop a particular form of renal failure known as hepatorenal syndrome (HRS), which is due to a vasoconstriction of the renal circulation (1). The histologic appearance of the kidneys in HRS is normal, and the kidneys regain a normal or near-normal function after liver transplantation. Both findings demonstrate the functional nature of HRS. Besides changes in renal function, patients with HRS also show marked abnormalities in the systemic arterial circulation and activity of endogenous vasoactive systems, which probably play a major role in the development of renal hypoperfusion. For these reasons, HRS constitutes a unique pathophysiologic disorder to study the relationship between the systemic circulation and renal function and the effects of vasoconstrictor and vasodilator factors on renal circulation. The aim of the current article is to provide an updated review of the pathophysiology, diagnosis, clinical features, and therapy of HRS in cirrhosis. The first description of disturbances in renal function in chronic liver diseases was made by Frerichs and Flint in two independent reports from the late nineteenth century (2). These reports described the development of oliguria in patients with chronic liver disease in the absence of proteinuria and with a normal renal histology, and proposed the first pathophysiologic interpretation of HRS by linking the abnormalities of renal function to the disturbances present in the systemic circulation. The detailed clinical description of HRS, however, was not made until the 1950s in studies by Sherlock, Papper, and Vessin (2,3). These studies emphasized the functional nature of renal failure, the coexistence of abnormalities in the systemic circulation, and the poor prognosis of the syndrome. Investigations performed in the 1960s and 1970s, particularly those by Epstein (4), demonstrated that renal failure in HRS is due to an extreme vasoconstriction of the renal circulation and paved the way for a large number of studies assessing the role of vasoactive substances in the pathogenesis of renal hypoperfusion in HRS. Relevant among these investigations are those implicating the renin-angiotensin system, the sympathetic nervous system, and renal prostaglandins (5). Important recent contributions include the description of a strong association between bacterial infections, especially spontaneous bacterial peritonitis, and the development of HRS in patients with cirrhosis and the use of vasopressin analogues in the management of HRS (6,7,8). Finally, the proposal of the arterial vasodilation hypothesis of ascites formation and the recent Consensus Conference on Definition and Diagnostic Criteria of Hepatorenal Syndrome represent key contributions to the recent history of HRS that have stimulated markedly the clinical research in this field (1,9). The main reason for the confusion that has surrounded the term HRS for many years was the absence of a widely accepted definition and diagnostic criteria of the syndrome. 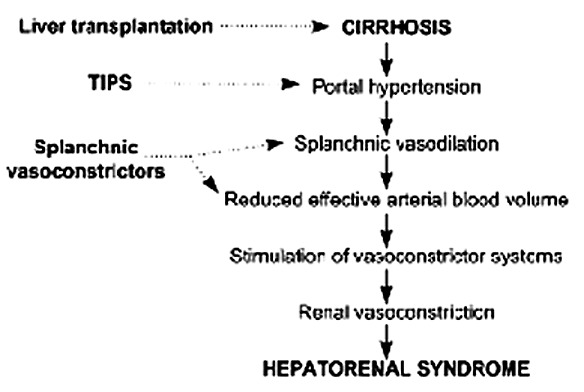 A Consensus Conference on HRS organized by the International Ascites Club in 1994 proposed the following definition, which emphasizes the changes occurring in both the renal and extrarenal circulations: “Hepatorenal syndrome is a clinical condition that occurs in patients with chronic liver disease, advanced hepatic failure, and portal hypertension characterized by impaired renal function and marked abnormalities in the arterial circulation and activity of the endogenous vasoactive systems. In the kidney there is marked renal vasoconstriction that results in a low GFR, whereas in the extrarenal circulation there is predominance of arterial vasodilation, which results in reduction of total systemic vascular resistance and arterial hypotension.” (1) Although HRS occurs predominantly in advanced cirrhosis, it may also develop in other chronic liver diseases associated with severe liver failure and portal hypertension, such as alcoholic hepatitis, or in acute liver failure. The pathophysiologic hallmark of HRS is vasoconstriction of the renal circulation (4,5). The mechanism of this vasoconstriction is incompletely understood and possibly multifactorial, involving changes in systemic hemodynamics, increased pressure in the portal venous system, activation of vasoconstrictor factors, and suppression of vasodilator factors acting on the renal circulation (Table 1). A detailed analysis of these alterations and their possible role in the pathogenesis of renal vasoconstriction is outside the scope of this article and may be found in several recent reviews (10,11). The theory that better explains the relationship between changes in the renal circulation, activation of vasoconstrictor mechanisms, and presence of marked disturbances in systemic hemodynamics is the arterial vasodilation theory (9,12). This theory proposes that renal hypoperfusion represents the extreme manifestation of underfilling of the arterial circulation secondary to a marked vasodilation of the splanchnic vascular bed (Figure 1). This arterial underfilling would result in a progressive baroreceptor-mediated activation of vasoconstrictor systems (i.e., the renin-angiotensin and sympathetic nervous systems) that would eventually cause vasoconstriction not only in the renal circulation but also in other vascular beds (lower and upper limbs, cerebral circulation; see below). The splanchnic area would escape the effect of vasoconstrictors, and an intense vasodilation would persist because of a markedly enhanced local production of vasodilator factors. Most of the available data suggest that the most important factor responsible for splanchnic vasodilation in cirrhosis is nitric oxide, although other factors such as prostaglandins and vasodilator peptides may also play a role (13). In early phases following the development of portal hypertension, renal perfusion would be maintained within normal or near-normal levels despite the overactivity of vasoconstrictor systems by an increased synthesis/activity of renal vasodilator factors. However, in later phases of the disease, renal perfusion would not be maintained because of the extreme arterial underfilling causing maximal activation of vasoconstrictor systems and/or decreased activity of renal vasodilator factors, and HRS would develop. The observation that the administration of drugs causing vasoconstriction of the splanchnic circulation is associated with suppression in the activity of endogenous vasoconstrictor systems and marked improvement of GFR is a strong argument supporting the arterial vasodilation theory (7,8,12). Proposed pathogenesis of hepatorenal syndrome in cirrhosis according to the arterial vasodilation theory and effective therapeutic interventions. TIPS, transjugular intrahepatic portosystemic shunt. An alternative theory proposes that renal vasoconstriction in HRS is the result of a direct relationship between the liver and the kidney and bears no pathogenic relationship with the disturbances in systemic hemodynamics. The link between the liver and the kidney would be either a vasodilator factor, the synthesis of which would be reduced as a consequence of liver failure, or a hepatorenal reflex causing renal vasoconstriction (14,15). However, no such putative liver vasodilator factor has been described, and the existence of a direct hepatorenal reflex has been demonstrated in animals but not in humans. Hepatorenal syndrome is a common complication of patients with cirrhosis, with a reported incidence of about 10% among hospitalized patients with ascites. The manifestation of HRS is characterized by a combination of renal failure, circulatory abnormalities, and liver failure. Renal failure may have a rapid or insidious onset (see below) and is usually associated with marked sodium and water retention that results in ascites and edema and dilutional hyponatremia (1,10). Abnormalities of circulatory function in patients with HRS include a high cardiac output, low arterial pressure (most patients have a mean arterial pressure in the range of 60 to 80 mmHg), and total systemic vascular resistance (Table 2). This pattern of renal vasoconstriction and systemic vasodilation is very characteristic of HRS, although not exclusive, because it may be observed in renal failure associated with conditions other than cirrhosis, such as sepsis. Another important hemodynamic feature of HRS is that the reduction in total systemic vascular resistance and arterial pressure occurs in the setting of an increased activity of vasoconstrictor systems (i.e., the renin-angiotensin system and the sympathetic nervous system), which suggests that the reduction in arterial pressure would be even greater if these systems were not acting on the systemic circulation. Although it was traditionally considered that the increased vascular resistance in HRS occurred only in the renal circulation, recent findings indicate that the vascular resistance is also increased in upper and lower limbs and in the cerebral circulation (16,17). These findings indicate that the vascular bed responsible for the reduction in total systemic vascular resistance in HRS is exclusively the splanchnic circulation. As discussed below, this finding has important implications when designing pharmacologic strategies to improve renal perfusion in patients with HRS. Finally, the third type of clinical manifestation of HRS is related to the existence of liver failure. Most patients show findings of advanced liver insufficiency, particularly jaundice, coagulopathy, poor nutritional status, and encephalopathy, although some patients with HRS show only moderate signs of liver failure. Two different clinical types of HRS have been described according to the intensity and form of onset of renal failure (1). Type I HRS is characterized by a rapid and progressive impairment of renal function as defined by a doubling of the initial serum creatinine to a level higher than 2.5 mg/dl or a 50% reduction of the initial 24-h creatinine clearance to a level lower than 20 ml/min in less than 2 wk. The dominant features of type I HRS are marked renal failure with oliguria or anuria and increased serum levels of urea and creatinine. Despite an extreme reduction of GFR (mean values are approximately 10 ml/min), serum creatinine levels in patients with HRS are usually lower than values observed in patients with acute renal failure without liver disease (10). This is probably due to the lower endogenous production of creatinine secondary to reduced muscle mass in patients with cirrhosis compared to patients without liver disease. Severe hyperkalemia is uncommon except in patients receiving aldosterone antagonists. Likewise, severe metabolic acidosis and pulmonary edema, which are frequent complications of acute renal failure in patients without liver disease, are uncommon in patients with type I HRS. This type of HRS is frequently seen in patients with alcoholic cirrhosis, especially when associated with alcoholic hepatitis, but it occurs in nonalcoholic cirrhosis as well. Most patients show signs of severe liver failure with marked hyperbilirubinemia, low prothrombin activity, and encephalopathy. Type I HRS is associated with a very low survival expectancy, the median survival time being only 2 wk (18). In contrast to type I, type II HRS is characterized by less severe and stable reduction of GFR that does not meet the criteria proposed for type I. Patients are usually in better clinical condition than those with type I HRS, and their survival expectancy is markedly longer. The dominant clinical feature of these patients is diuretic-resistant ascites due to the combination of intense sodium retention, reduced GFR, and marked stimulation of antinatriuretic systems (1). In some patients, HRS develops without any identifiable precipitating factor, whereas in others it occurs in close chronologic relationship with some complications or therapeutic interventions such as bacterial infections or therapeutic paracentesis without plasma volume expansion (6,19). Among bacterial infections, spontaneous bacterial peritonitis has been increasingly recognized in recent years as the most common precipitating factor of HRS in patients with cirrhosis. This condition is characterized by the spontaneous infection of ascitic fluid in the absence of any intra-abdominal source of infection (20). In most cases, the bacteria responsible for the infection are of enteric origin, especially Gram-negative bacilli. Approximately one-third of patients with spontaneous bacterial peritonitis develop an impairment of renal function in the absence of shock and despite treatment with non-nephrotoxic antibiotics (6). The impairment in renal function is of functional origin and occurs in the setting of a decrease in effective arterial blood volume, as indicated by a marked activation of vasoconstrictor systems, and increased serum and ascitic fluid levels of cytokines (21). In approximately 10% of patients, the impairment in renal function is reversible after resolution of infection and does not meet the criteria of HRS (see below). However, in the remaining patients, the impairment in renal function is not reversible after the resolution of the infection and in half of them meets the criteria of type I HRS. Gastrointestinal bleeding has been classically considered a precipitating factor of HRS (3). However, the development of renal failure after this complication is uncommon in patients with cirrhosis, occurs almost exclusively in patients who have developed hypovolemic shock, and in most cases is associated with ischemic hepatitis, which suggests that renal failure in patients with gastrointestinal bleeding is probably related to the development of acute tubular necrosis (ATN) and is not of functional origin (P. Ginès, unpublished observations). Diuretic treatment has also been classically described as a precipitating factor of HRS, but there is no clear evidence to support such a pathogenic relationship. Because HRS is a form of functional renal failure, the characteristics of urine are those of prerenal azotemia, with oliguria, low urine sodium concentration, and an increased urine osmolality and urine-to-plasma osmolality ratio (1). Nevertheless, there are nonoliguric forms of the syndrome, and in some cases urine sodium concentration is not extremely reduced. Due to the lack of specific diagnostic tests, the diagnosis of HRS is currently based on several diagnostic criteria as proposed recently (1). These criteria are aimed at demonstrating a low GFR and excluding other causes of renal failure that may also occur in patients with cirrhosis (Table 3). The level of serum creatinine required for the diagnosis of HRS is 1.5 mg/dl, in the absence of diuretic therapy. Although this value may seem rather low, patients with cirrhosis and a serum creatinine above 1.5 mg/dl have a GFR below 30 ml/min (10). The second step in the diagnosis of HRS is to rule out other causes of renal failure, especially prerenal failure secondary to volume depletion, ATN, drug-induced nephrotoxicity, and glomerulonephritis (1). Causes that may predispose to prerenal failure such as significant gastrointestinal fluid losses due to vomiting or diarrhea, or renal fluid losses due to excessive diuretic therapy should be excluded before the diagnosis of HRS is made. In prerenal failure due to volume depletion, renal function improves rapidly after the intravenous administration of fluids, whereas no improvement occurs after this maneuver in patients with HRS. It is currently accepted that volume depletion in patients with cirrhosis can be ruled out on the basis of clinical signs and the response to a trial of plasma expansion, and that measurement of central venous pressure or pulmonary capillary wedged pressure is not required for the diagnosis of HRS. The existence of shock before the development of renal failure precludes the diagnosis of HRS, and points to the existence of ATN. Likewise, the diagnosis of HRS should not be made in patients with recent or current treatment with nephrotoxic drugs, mainly nonsteroidal anti-inflammatory drugs or aminoglycosides. The presence of significant proteinuria (>500 mg/d) and/or ultrasonographic abnormalities in the kidneys excludes the diagnosis of HRS and suggests the existence of an organic cause of renal failure, such as glomerulonephritis, which is commonly associated with alcoholic cirrhosis or hepatitis B- or C-associated cirrhosis (1). In these patients, a renal biospy should be performed, when indicated, for the diagnosis of the underlying renal disease. Many therapeutic methods have been used to improve renal function in patients with HRS (10,22). However, most of these methods have no effect or only minor beneficial effects, except for liver transplantation, the administration of drugs with a vasoconstrictor effect in the splanchnic circulation, and the insertion of transjugular intrahepatic portosystemic shunts (Figure 1). Because HRS is a functional disorder due to advanced liver disease, liver transplantation is theoretically the ideal treatment for patients with HRS because it allows the cure of both the diseased liver and the associated renal dysfunction. The long-term outcome of patients with cirrhosis and HRS treated by liver transplantation is usually good, although the presence of HRS is associated with an increased morbidity and early mortality (23,24). Immediately after transplantation, a further impairment in renal function occurs in most patients and more than one-third require hemodialysis (compared with only 5% of patients transplanted without HRS). Nevertheless, only a small proportion of patients (approximately 5%) progress to end-stage renal disease and require long-term dialysis. Because this impairment in renal function is probably related, at least in part, to the administration of cyclosporine or tacrolimus, it has been suggested that these drugs should not be given until a recovery of renal function is observed, which usually occurs 48 to 72 h after transplantation. Besides the impairment in renal function, patients transplanted with HRS have more complications, spend more days in the intensive care unit and in the hospital, and have a higher in-hospital mortality rate than patients transplanted without HRS. Nevertheless, long-term survival after transplantation is excellent, with the probability of survival 3 yr after transplantation approaching 60% (23). This survival is only slightly reduced compared to that of 70 to 80% of transplanted patients without HRS and markedly increased compared to the survival of nontransplanted patients with HRS, which is close to 0% after 3 yr. The main problem regarding liver transplantation for patients with HRS is that because of the poor prognosis of HRS and the prolonged waiting times in most transplant centers, a significant proportion of patients with HRS, particularly those with type I HRS, die before transplantation is possible. Therefore, there is a need for effective therapies to increase survival of these patients until transplantation can be performed. An alternative, but not exclusive, approach to this problem is to identify the need for liver transplantation before the development of HRS. Several predictive factors for the development of HRS in patients with cirrhosis and ascites have been identified (Table 4) (18). Patients showing some or all of these predictive factors should be considered for liver transplantation before the development of HRS. Of note, the severity of liver dysfunction, as assessed by the Child-Pugh classification (a scoring system that combines serum bilirubin and albumin levels, prothrombin time, and the presence and degree of ascites and hepatic encephalopathy), has no predictive value for the development of HRS in patients with cirrhosis and ascites (18). The administration of vasoconstrictors represents the most promising pharmacologic approach to therapy of HRS. These drugs have been used in an attempt to improve renal perfusion by increasing systemic vascular resistance and suppressing the activity of endogenous vasoconstrictors (Figure 1). Because arterial vasodilation in HRS is located exclusively in the splanchnic circulation, the ideal vasoconstrictor for patients with HRS would be a drug with a selective action in the splanchnic arteries with no effect on the extrasplanchnic circulation, to prevent ischemic complications, and in the renal circulation. Although such a vasoconstrictor is not available at present, the family of drugs that are closest to these requirements are the agonists of the vasopressin V1 receptor (analogues of vasopressin with a predominant action on the V1 receptor and less effect on the V2 receptor). α-Adrenergic agonists (i.e., norepinephrine, metaraminol, or midodrine) and agonists of the angiotensin AT1 receptors have been used without significant clinical benefit (22). By contrast, the administration of V1 receptor agonists, such as ornipressin or terlipressin, is associated with suppression of the activity of endogenous vasoconstrictor systems, marked improvement of renal perfusion and GFR, and normalization of serum creatinine levels in most patients (7,8,25,26) (P. Ginès, unpublished observations). Although the information about the use of V1 agonists in patients with HRS is still very limited and based only on a few Phase II studies conducted in a small series of patients and on isolated case reports, several preliminary conclusions may be drawn while awaiting the results of large randomized studies. (1) These drugs should be given for prolonged periods, usually 7 to 15 d, because the improvement of renal function occurs slowly. In patients in whom normalization of serum creatinine has been achieved, HRS usually does not recur after discontinuation of therapy. (2) The effective doses of these drugs have not been defined precisely and may vary from patient to patient. Ornipressin has been given as a continuous intravenous infusion at doses ranging from 1 to 6 IU/h, whereas terlipressin has been given in intravenous boluses from 0.5 to 2 mg/4 h. (3) In some studies, the concomitant administration of albumin has been used to further improve effective arterial blood volume. Whether this maneuver increases the beneficial effects of these drugs on renal function is not known. (4) The incidence of important ischemic side effects requiring the withdrawal of the drug is high, especially with ornipressin. The ischemic complications appear to be less common in patients treated with terlipressin, which has a better safety profile than ornipressin, but this observation requires confirmation in larger studies. The high frequency of ischemic complications should be weighed against the lack of alternative pharmacologic therapies for HRS. (5) The potential benefit of the improvement of renal function on survival of patients with HRS has not been assessed and requires investigation in large comparative studies. (6) Because of limited information and relevant side effects, treatment with V1 agonists should probably be restricted at present to patients with type I HRS. Despite the existence of isolated reports of improvement of renal function in patients with HRS after side-to-side or end-to-side portacaval shunts during the 1970s, these procedures did not become an accepted therapy for HRS because of their tendency to result in high morbidity and mortality (22). However, the recent introduction of a nonsurgical method of portal decompression, the transjugular intrahepatic portosystemic shunt (TIPS), has led to the reconsideration of this therapeutic approach in the management of HRS (27). TIPS is usually performed under analgesia and consists of the placement of a self-expandable metal stent between a hepatic vein and the intrahepatic portion of the portal vein using a transjugular approach. Because of its powerful effect in reducing portal pressure, TIPS has become a therapy frequently used in highrisk patients bleeding from esophageal varices not responding to usual therapeutic measures. Its use is also being evaluated in the management of refractory ascites (28). The information about the effect of TIPS in patients with HRS is still very limited, but published studies indicate that TIPS improves renal perfusion and GFR and reduces the activity of vasoconstrictor systems (29,30). In patients with type II HRS, the improvement of renal perfusion is associated with an increase in urinary sodium excretion and improved renal response to diuretics. In patients with type I HRS, the use of TIPS is associated with a moderate increase in renal blood flow and GFR and a reduction in serum creatinine levels in some, but not all, patients. As with vasoconstrictor drugs, it is unknown whether the improvement in renal function is associated with an increased survival. Because the use of TIPS is frequently associated with significant side effects, particularly hepatic encephalopathy and impairment of liver function, its role in the management of HRS needs to be established by prospective controlled investigations. Drugs with renal vasodilator activity have been used in patients with HRS in an attempt to counteract the effect of vasoconstrictor factors on the renal circulation. Dopamine was the first drug used due to its renal vasodilatory effect when given in subpressor doses. Although there are isolated reports of reversal of HRS after dopamine administration, studies specifically assessing the effects of dopamine on renal function in patients with HRS have shown no effect or only minor effects on GFR (22). Despite its lack of efficacy, dopamine is still commonly used in clinical practice in patients with HRS. The second type of renal vasodilators used in patients with HRS are prostaglandins and prostaglandin analogues (22). The rationale for the use of prostaglandins was the belief that renal vasoconstriction in HRS could be due to reduced intrarenal synthesis of prostaglandins. Unfortunately, however, no beneficial effects on renal function have been observed after the intravenous or intra-arterial administration of prostaglandin A1 (PGA1) or PGE2. The oral administration of misoprostol (a PGE1 analogue) was found to improve renal function in one study, but this beneficial effect was not confirmed in a subsequent investigation (22). The potential efficacy of this drug deserves further investigation, but its use in clinical practice may be limited by the high incidence of side effects, especially diarrhea. Peritoneovenous shunting was widely used in the past in the management of patients with cirrhosis and refractory ascites, which is commonly seen in association with type II HRS. However, the use of this method has declined markedly because of significant side effects and the existence of other therapeutic methods with a similar efficacy but fewer side effects (i.e., therapeutic paracentesis associated with albumin administration) (31). In patients with type I HRS, peritoneovenous shunting prevents the progression of renal failure but does not prolong survival compared with supportive therapy (33). For these reasons, peritoneovenous shunting is rarely used at present in the management of patients with HRS. Hemodialysis or peritoneal dialysis has been used in the management of patients with HRS, and sporadic cases of improvement of renal function have been reported (22). Unfortunately, there are no controlled studies evaluating the effectiveness of dialysis in HRS. Uncontrolled studies suggest that dialysis is not very effective because most patients die during treatment and there is a high incidence of severe side effects, including arterial hypotension, coagulopathy, and gastrointestinal bleeding. In some centers, hemodialysis is used to treat patients with HRS awaiting liver transplantation. The effectiveness of dialysis in this setting has not been appropriately studied. Continuous arteriovenous and venovenous hemofiltration have also been used but their efficacy also remains to be determined (22). Until now, no effective methods for prevention of HRS existed. However, recent data indicate that the development of HRS in the setting of spontaneous bacterial peritonitis can be effectively prevented by the administration of albumin (1.5 g/kg intravenously at the diagnosis of the infection and 1 g/kg intravenously 48 h later) together with antibiotic therapy (33). The incidence of HRS is markedly lower in patients receiving albumin compared with that of patients not receiving albumin. More importantly, albumin administration also improves survival in these patients. The beneficial effect of albumin is probably related to its capacity to prevent the impairment in the effective arterial blood volume and subsequent activation of vasoconstrictor systems that occurs during the infection. Hepatorenal syndrome is a common complication of advanced cirrhosis characterized not only by renal failure but also by marked alterations in systemic hemodynamics and activity of endogenous vasoactive systems. Renal failure is due to marked vasoconstriction of the renal circulation. The pathogenesis of hepatorenal syndrome is not completely known, but it is probably the result of an extreme underfilling of the arterial circulation secondary to an arterial vasodilation located in the splanchnic circulation. Besides the renal circulation, all other extrasplanchnic vascular beds appear also to be vasoconstricted. The diagnosis of hepatorenal syndrome is currently based on several widely accepted diagnostic criteria aimed at excluding nonfunctional causes of renal failure. The prognosis of patients with hepatorenal syndrome is very poor. Liver transplantation is the best option in selected patients, but it is not always applicable due to the short survival expectancy. Therapies introduced during the past few years, such as vasoconstrictor drugs with preferential effect on the splanchnic circulation (V1 receptor agonists) or transjugular intrahepatic portosystemic shunts, are effective in improving renal function. However, their impact on the natural course of hepatorenal syndrome remains to be assessed in prospective investigations. Finally, the development of HRS after spontaneous bacterial peritonitis can be effectively prevented by the administration of albumin together with antibiotic therapy. These studies were supported in part by grants from the Fondo de Investigación Sanitaria (FIS 97/2073 and FIS 94/0956).